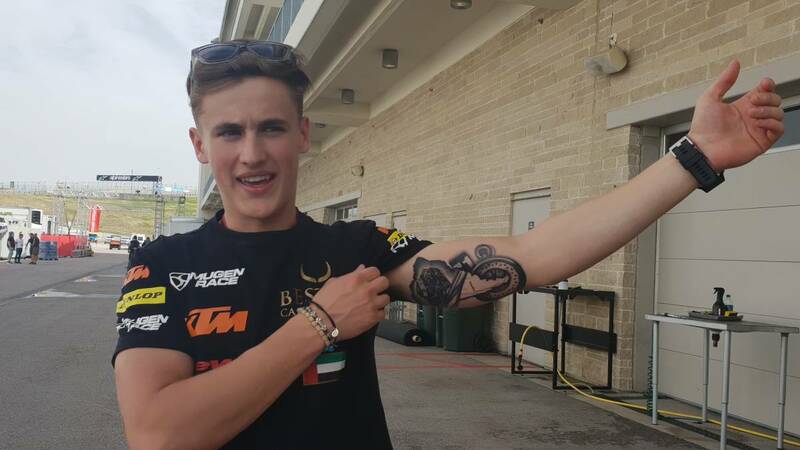 Home Moto Masiá: "I have tattooed the first pole and victory"
Masiá: "I have tattooed the first pole and victory"
"An athletics chronometer watch, which represents the first pole, with the time I did. Also the silhouette of the trophy and the bike, "says the winner of Argentina. The GP of Argentina of Moto3 served so that Jaume Masiá will premiere at 18 years old his box of victories and poles mundial. On his return home, he celebrated by getting a tattoo on the biceps of his left arm that will forever remind him of that milestone. -The palmares, with the victory of Argentina, is not the only change he has experienced in his arrival to Austin. - (Smiles). It is true. I have a tattoo on my left arm that is a small memory. I had wanted to do it for a long time, but I needed a motive and I already have it. -The clock is a chrono of the old ones, the typical athletics chronometer, which represents the first pole. Then the time I made on pole is marked. There is also the silhouette of the victory trophy, which is South America. And the bike with which I got it. -There, in the biceps, it has to be painful, right? -A little, a little. More than the phrase I have on the right thigh. -How many times have you seen at home the race of your first GP victory? -A few times, like three or four. -And what do you feel? -I get very nervous. At the end of the race are great emotions. It was brutal. Seeing it is as if I were there and I live it the same. I am super happy and proud. I have also seen the interview you did to my father, who is a crack, and to Josete, my technician, with whom I connected from the first moment. We all started crying because it was a great emotion. -Have you analyzed what you have to do to repeat this result more times? -We have a clear job. We knew what we were capable of. We showed it in the Jerez tests, but then in Qatar it was very complicated with the injury he was carrying. The potential is and what you have to do is try not to get nervous, which is often what I sin. When I do not see myself in the top ten, my mind becomes cloudy and I do not think we're working for the race. This with experience is gained. We are facing it quite well. -Does that victory compensate for all the physical pain of the injuries and mental for so many difficulties? -No one imagines the work behind to get what I did, and how difficult it is. The victory makes up for it, because it makes me not feel bad. This is what I like, what I am passionate about and what I am every day. It's not that it compensates me, it's part of it. -Can you fight for the World Cup or is that much to say? -No, no, no. It is not my goal. I would like it, but who knows? -Many people congratulated me. The truth is that it has been quite a media triumph. I'm very happy. One of those who congratulated me was Márquez (his face lights up), but the ones that arrive most are those of the closest people, the ones I appreciate the most. -Do they look at him differently when they arrive at the paddock? -I have not noticed, but I do feel more secure, that no more left over. It's because I knew I had the potential, that I could do it and in the end I did it. I am happy and calm.